Wellington, FL – February 10, 2018 – In the first five star grand prix of the 2018 Winter Equestrian Festival (WEF) circuit, Daniel Bluman (ISR) and Ladriano Z, owned by Over The Top Stables LLC, rose to the top of the class in the $384,000 Fidelity Investments® Grand Prix on Saturday, February 10, at the Palm Beach International Equestrian Center. There were 40 entries in the grand prix, contesting a challenging course set by Kelvin Bywater of Great Britain in front of a jam-packed stadium of show jumping fans. Just two were clear to advance to the jump-off. First into the ring for the second round was FEI World Cup Finals winner and Olympic silver medalist Beat Mändli of Switzerland riding Dsarie, a 10-year-old KWPN mare by Veron x Ahorn owned by Grand Road Partners GmbH. They laid the gauntlet with a clear round in a time of 40.47 seconds, with Dsarie giving her customary bucks after going through the timers. Knowing what he had to beat, Bluman and Ladriano Z, a 10-year-old Zangersheide gelding by Lawito x Baloubet du Rouet, went for the win straight from the first fence. They shaved just enough time off to gallop home in a winning time of 39.43 seconds. Emma Kurtz of Hudson, OH piloted her mount A Million Reasons, owned by Dr. Betsee Parker, to the top of the class in week five’s Small Junior Hunter 16-17 division. The duo claimed three blue ribbons over fences and an additional blue in the under saddle. Having been paired with the 13-year-old Holsteiner mare for the first time at the beginning of the Winter Equestrian Festival (WEF) this year, Kurtz expressed her admiration for her new mount. Todd Minikus and Babalou 41. Photos © Sportfot. Wellington, FL – February 5, 2017 – Todd Minikus (USA) and Babalou 41 concluded week four of the 2017 Winter Equestrian Festival (WEF) with a victory in Sunday’s $216,000 Ariat® Grand Prix CSI 4*, held on the beautiful grass derby field at the Palm Beach International Equestrian Center (PBIEC) in Wellington, FL. Minikus topped a three-horse jump-off over Olympian Sergio Alvarez Moya (ESP) and G&C Unicstar de l’Aumone in second, and young rider Jennifer Gates (USA) riding Pumped Up Kicks for third. Course designer Steve Stephens (USA) wrapped up his duties for week four with the highlight grand prix event at PBIEC’s Equestrian Village, also home to the Adequan® Global Dressage Festival. Thirty-two entries started over Stephens’ first round course, and three were able to advance to the jump-off. First to jump clear in round one, and first to jump off, Jennifer Gates guided Evergate Stable’s Pumped Up Kicks through the short course in a steady time of 51.28 seconds, incurring two time faults to earn the third place prize. Sergio Alvarez Moya was next to go with G&C Farm’s Unicstar de l’Aumone, clearing the jump-off track in 40.30 seconds. Last to go, Minikus and Two Swans Farm’s Babalou 41 took the win, racing through the timers in 38.79 seconds. Minikus was awarded the Village of Wellington Cup, and Babalou 41 earned the Champion Equine Insurance Jumper Style Award, presented by Laura Fetterman. The 12-year-old Oldenburg mare (Balou du Rouet x Silvio I) showed her experience of competing around the world by heading onto the impressive field for the first time and putting in two faultless efforts. G&C Unicstar de l’Aumone is just nine years old, but the Selle Francais mare (Ninio de Rox x Timorrak des Isles) has experience winning on the grass. She and Moya topped two Sparkassen Youngster Cup Qualifiers at CHIO Aachen in 2016. Gates earned the Leading Lady Rider Award for week four, presented by Martha Jolicoeur of Douglas Elliman Real Estate, after Sunday’s top finish, and a sixth place in Thursday’s qualifier. She was thrilled with Pumped Up Kicks, her 14-year-old Brandenburg gelding (Levisto x San Juan). “I am over the moon,” Gates smiled. “I did him in some Under 25 classes last year out on the grass field, and he was amazing. I am ecstatic with how he jumped today. It took an experienced horse for that course, which I definitely had. Competing on Sunday in the International Arena on the main show grounds at PBIEC, Luciana Gonzalez Guerra and Guadalupe Gonzalez’s Star Light won the $10,000 SJHOF High Junior Jumper Classic, presented by Sleepy P Ranch. Abbie Sweetnam and Chadburn Holdings’ Parco topped the $10,000 Hollow Creek Farm Medium Junior Jumper Classic, and Alexandra Markarian and Bandro were victorious in the $10,000 Equiline Medium Amateur-Owner Jumper Classic. Emma Kurtz of Wellington, FL and Stellar won the championship in the Bruno DelGrange Large Junior Hunter 16-17 division on Sunday morning. The pair won the stake and the handy class, placed third and fourth over fences, and fourth under saddle. Week four was Kurtz’s second time showing Stellar. Stellar, a coming seven-year-old Hanoverian mare by Quintender, is owned and trained by Holly Orlando. It was Orlando’s six-year-old daughter, Logan, who led the mare in for the presentation photo alongside Kurtz. Raleigh Hiler of Sudbury, MA rode her own Chapman ET to reserve honors in the division. The pair earned first, second, fourth, and fifth place ribbons over fences, and a second place ribbon under saddle. Chapman ET is a nine-year-old warmblood gelding. The 2017 Winter Equestrian Festival continues with its fifth week of competition, sponsored by Fidelity Investments®, on February 8-12, 2017. For full results and more information, please visit www.PBIEC.com. Douglas Masters and Uno Z.
Lexington, KY – Aug. 5, 2016 – Before heading to work at CMW Architects in downtown Lexington, Douglas Masters hopped on Chris Richard’s Uno Z to ride to the win in the High Amateur-Owner Jumpers on Friday. In the High Junior Jumper division, which ran simultaneously, it was Emma Wujek and her own Ugaf who rode to victory. In the speed class, Masters and Uno Z delivered one of only three clear rounds, stopping the clock in just 57.945 seconds to claim the top spot. Masters said that balancing his professional career and amateur status as a rider has presented many challenges, but he is finally hitting his stride and finding a balance between both of his passions. Coming in second to Masters was Anne Gardner and her own After Eight, who clocked in a time of 61.493 seconds. The third and final clear came from David Oberkircher and Southfields Farm LLC’s Castelino Van De Helle, whose time of 67.28 seconds would earn them third place. On the High Junior Jumper card, which also saw three clear efforts, Wujek and Ugaf’s clear round of 59.017 seconds proved to be unbeatable by the other challengers. Wujek, who trains with Tim and Kelly Goguen, said she purchased the stallion as her first Junior Jumper halfway through the Winter Equestrian Festival in 2015. Boggs Hill Farm is based just around the corner, giving Wujek the opportunity to enjoy Kentucky year-round, and she loves showing at the Kentucky Horse Show. Finishing in second place on the junior card was Claire McKean, who piloted Eregast Van’t Kiezelhof across the finish line in 62.64 seconds. Third place went home with Mary Elizabeth Cordia, who clocked a time of 65.338 seconds in the irons on Chelsie. The 1.40m Open Jumpers kicked off Friday’s action in the Rolex Arena, and it was Sydney Shulman and the BCF Group’s Wamira who rode away with the blue ribbon. Finishing in second was Victor Amaya and Kristin Hull’s Arko, while third went to Alejandro Karolyi and Karolyi Showjumping Inc.’s Isibelle. The Kentucky Summer Classic will continue on Saturday with the highlight $50,000 Kentucky Summer Grand Prix, presented by GGT Footing and the $5,000 Hallway Feeds USHJA National Hunter Derby. 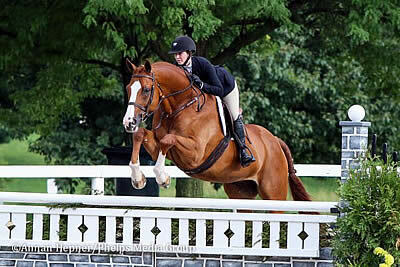 Junior rider Emma Kurtz of Hudson, Ohio won both the jumper phase and the hunter phase of the Washington International Horse Show (WIHS) Equitation on Friday of the Kentucky Summer Classic Horse Show. She rode Dr. Betsee Parker’s gelding Patrick to the double win in the equitation division. Kurtz first rode the chestnut gelding at the Maclay Finals last November and competed with him a handful of times at the Winter Equestrian Festival in Wellington, Florida, so she explained that she was still getting acclimated to his ride. The pair had placed second in the WIHS hunter phase last week at the Kentucky Summer Horse Show, and they returned this week focused on winning the blue. “The jumper phase this morning was so fun!” Kurtz said. “I was really nervous going in because I could only watch two riders go through it. The talented duo won the jumper phase with an impressive score of 94, which was five points ahead of the second place finisher, Casco M and Victoria Press’s score of 89. The jumper phase finished in the morning so the riders had the entire day to prepare for the WIHS hunter phase, which took place in the Alltech Arena. “It was surprising that we had to ride in the indoor ring because we are not used to competing indoors quite yet in the season,” Kurtz said. “Patrick was holding back a bit, but he was perfect. He never does anything wrong. I could just tell a little difference in the way he went versus riding outside. The hunter phase consisted of nine jumps with bending lines and a combination. Kurtz bested a field of 30 equitation riders to earn a score of 89. The top three finishers were within a point of each other with Madison Sellman and Alvarez L placing second in the hunter phase with a score of 88, and Samantha Cohen and Trump coming in third with an 87. She plans on continuing to get to know Patrick through the summer by competing in the equitation divisions at the Blue Grass Festival Horse Show later in August before heading off to the Hampton Classic. Feature events of the Kentucky Summer Classic Horse Show include the $50,000 Kentucky Summer Grand Prix presented by GGT Footing and the $5,000 Hallway Feeds USHJA National Hunter Derby. 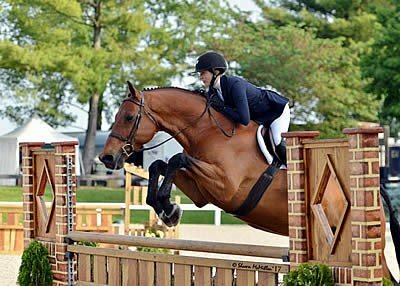 Lexington, KY – July 30, 2016 – The luck of the Irish certainly favored the winners of Saturday’s $50,000 Rood & Riddle Kentucky Grand Prix at the Kentucky Summer Horse Show. Irish riders Shane Sweetnam and Christina Kelly rode away with the top three ribbons, with first and third won by Sweetnam and Kelly earning second. The first round saw 30 entries over fellow Irishman Alan Wade’s course, with 14 horse-and-rider combinations eventually advancing to the short course. The spectators cheered from the stands, enjoying the top-quality show jumping during the Kentucky Horse Park’s 14th annual Hats Off Day. Kelly and Andrea O’Brien’s Kingdom were among the first to turn in a clear round, securing their place in the jump-off early on in the class. Sweetnam and the Blue Buckle Group LLC’s Cobolt jumped their clear effort shortly after, and later Sweetnam followed up with another jump-off-qualifying round aboard Main Road, owned by Sweet Oak Farm and Seabrook LLC. As the riders returned for the jump off, only five of the 14 qualified would repeat their clear efforts. Kelly returned with Kingdom to lay down a quick round, saving time by taking tight turns and opening up the 17.3-hand horse’s massive stride between the combinations. Kelly and Kingdom stopped the timers in 45.474 seconds, securing her hold on the lead. Sweetnam entered the ring on Cobolt shortly after, taking his turns even tighter and using his smaller horse’s agility to its full potential to shave an impressive two seconds off of Kelly’s leading time, finishing the course in a mere 43.882 seconds to take over the top spot. During his career with Cyklon 1083, Sweetnam has experienced a lot of success. At 10 years old, Cobolt is one of Cyklon’s oldest sons and is following in his father’s footsteps. Sweetnam got the ride on the gelding in January, and has since won the $130,000 Ariat Grand Prix CSI3* at Tryon, among other successes at the 1.50m level. The final rider to return to the ring, it was clear that Sweetnam would be taking home the blue ribbon, but it was a question of whether he could beat his earlier time on his next mount, Main Road. Despite coming close with their clear effort, Sweetnam and Main Road’s time of 46.444 seconds would earn them the third-place ribbon. Also going double clear, Adrienne Sternlicht and Starlight Farms 1 LLC’s Toulago tripped the timers in 49.442 seconds to take home fourth place. Trailing very closely behind, Juan Ortiz and the Synchronicity Group’s D’ulien Van De Smeets ended up in fifth place with their time of 49.842 seconds. Despite having the second-fastest time at 44.372 seconds, Venezuela’s Pablo Barrios and A S D Farfala rounded out the top six after catching an unfortunate four faults for having a rail down. The final highlights during the Kentucky Summer Horse Shows include the $5,000 Hallway Feeds USHJA National Hunter Derby and the $10,000 Under 25 Grand Prix. The action will resume next week during the Kentucky Summer Classic. Emma Kurtz dominated the Stonelea Ring on Saturday at the Kentucky Summer Horse Show with wins on Dominik in the Small Junior Hunter division, as well as a clean sweep in the Large Junior Hunter 15 & Under division on Frederick. Kurtz has had the ride on David Gochman’s chestnut gelding for over a year, and the pair are no strangers to winning blue ribbons and championship titles. In Saturday’s Large Junior Hunter 15 & Under division, Kurtz and Frederick won both over fences classes and the under saddle class. Kurtz of Hudson, Ohio also impressed the judges on David Gochman’s gelding Dominik. This was the third show the duo has competed together and though they are a relatively new pair they were Grand Champions at Brandywine. On Saturday, they earned the blue ribbon in both over fences classes during the Small Junior Hunter division. She plans on riding him in next week’s Kentucky Summer Classic and then Sophie and Mimi Gochman will pick up the ride. Brett Burlington of Miami, Florida leads the way in the Large Junior Hunter 16-17 division on Popish Farms LLC’s Due West. The pair won an over fences class as well as placed second in the under saddle class. Burlington competed the 12-year-old gelding during the winter season at WEF and they were champions in Traverse City earlier in the summer. 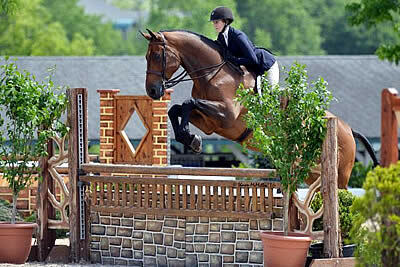 All junior hunter divisions will wrap up on Sunday morning at the Kentucky Summer Horse Show. On Saturday morning, championships were awarded in the Amateur-Owner Hunter divisions. Jane Gaston won the Visse Wedell Grand Hunter Championship, as well as the Amateur-Owner Hunter Championship aboard Because. 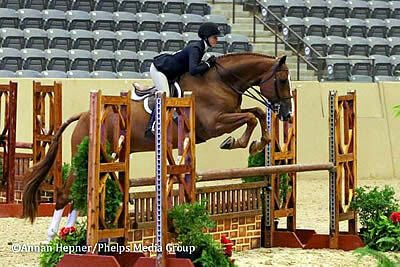 The KWPN gelding had also earned the Green Hunter Championship with Kelley Farmer earlier in the week. Lisa Butzer earned the tricolored ribbon for the Amateur-Owner 3’3 18-35 division on Pure Imagination, while Didi Mackenzie and MTM Do Right was crowned champion in the Amateur-Owner Hunter 3’3 Over 35 division. On Sunday, the $5,000 Hallway Feeds USHJA National Hunter Derby will take place and it will be the third class in the $40,0000 Hallway Feeds USHJA National Hunter Derby series. The $15,000 Hallway Feeds Leading Rider Bonus will award a $10,000 cash prize to the professional rider accumulating the most points in the five classes that make up the 2016 Hallway Feeds series. The series-leading amateur and junior riders accumulating the most points will each receive a $2,500 cash prize. Riders will receive points only on their highest placed horse in each of the classes. The awards will be presented at the conclusion of the Hallway Feeds class at the Bluegrass Festival Horse Show on August 21. Devon, Pa. – The 2016 US Junior Hunter National Championship East Coast came to a close on Tuesday, following two days of competition in the historic Dover Arena at the Devon Horse Show grounds. More than 150 of the country’s top juniors headed to the championship to complete three phases in front of the judging panel of Linda Andrisani, Holly Orlando, and James Toon over Skip Bailey-designed Classic Round course and Handy Hunter courses, which both counted for 40% of the overall score. The final 20% was earned in Tuesday’s Under Saddle phase which was judged by Jeff Ayers, Rob Bielefeld, and Bill Ellis. Emma Kurtz and Caldwell posted the best overall score of the 3’6″ competition to earn the 2016 Grand Champion title. In the 3’3″ championship, Devin Seek and Dress Balou earned Grand Champion honors. Kurtz (Hudson, Ohio) and Scott Stewart’s 13-year-old Hanoverian gelding, Caldwell, earned the 2016 National Title after scoring 99.2 in the Classic Round, 51 in the Under Saddle, and 102.8 in the Handy Round, to finish on an overall score of 253. The talented pair also earned the Large Junior Hunter 15-and-Under crown, taking home the USA National Junior Hunter Championship Perpetual Trophy donated by Mr. and Mrs. Donald Stewart, Jr.
Kurtz and David Gochman’s Dominik scored the Reserve Overall Grand Champion title. Kurtz and the eight-year-old Warmblood gelding earned scores of 102.8, 52.2, and 94.4 in the Classic, Under Saddle, and Handy Rounds, respectively, and an overall score of 249.4. The pair also posted the best score in the Small Junior Hunter 15-and-Under section, taking home the USA National Championship Perpetual Trophy donated by Geri and Whitney Roper. Caroline Jones (Brownsboro, Ala.) and Century Performance Horses LLC’s At Last posted the top score in the Large Junior Hunter 16-17 section, taking home the USA National Championship Perpetual Trophy donated by Christina Schlusemeyer. Jones and the 11-year-old Oldenburg gelding finished on an overall total of 239.5 after posting scores of 92.5, 47.6, and 99.4 in the Classic, Under Saddle, and Handy Rounds, respectively. In Small Junior Hunter 16-17 competition, Eliza Bienstock (New York, N.Y.) and her own Playlist earned the top score of 241, taking home the USA National Junior Hunter Championship Perpetual Trophy donated by Pam and Wayne Baker. Bienstock and the 11-year-old Swedish Warmblood gelding posted scores of 95.2, 50.4, and 95.4 in the Classic, Under Saddle, and Handy Rounds, respectively. The top Owner/Rider for the 3’6″ section was MTM Hands Down, ridden by Annabel Revers and owned by her family’s Beechwood Stables, LLC, finishing with an overall score of 246.2. Seek (Ridgefield, Conn.) and Donald Stewart’s Dress Balou topped the 3’3″ Junior Hunter 15-and-Under section A on their way to earning Overall Grand Champion honors in the 3’3″ section. Seek and the seven-year-old Warmblood gelding earned scores of 103.2 in the Classic Round, 50.8 in the Under Saddle, and 104.4 in Handy Round to finish on an overall total of 258.4. Grace Boston earned Reserve Overall Grand Champion in the 3’3″ section with Donald Stewart’s six-year-old Hanoverian gelding, Spalding. The pair, which had the highest score in the 3’3″ Junior Hunter 15-and-Under section B, scored 91.6, 52, and 100.2 in the Classic, Under Saddle, and Handy Rounds, respectively, to finish on an overall total of 243.8. Grace Hutson (Lancaster, Pa.) and her own 10-year-old Hanoverian gelding, Davinci, topped 3’3″ Junior Hunter 16-17 Section A competition after finishing on an overall score of 239.4. 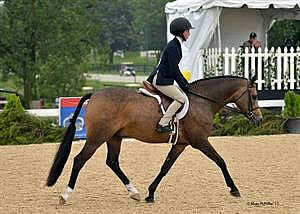 They produced scores of 96.3, 49.1, and 94 in the Classic, Under Saddle, and Handy Rounds, respectively. Additionally, Hutson was crowned top Owner/Rider in the 3’3″ section. Isabel Stettinius (Washington D.C.) and her own Balenciaga, a 10-year-old Oldenburg gelding, won the 3’3″ Junior Hunter 16-17 Section B with an 88.6 in the Classic round, a 49.2 in the Under Saddle, and a 99.0 in the Handy round, for an overall score of 236.8. Sydney North’s Valentine, a nine-year-old Irish Sport Horse, was also honored as the Best Overall Mare and received the War Dress Memorial Trophy donated by Cleta S. Turbow and Pamela J. Rush after receiving an overall score of 241. Visit usefnetwork.com for photos and videos from the 2016 US Junior Hunter National Championship East Coast. Eve Jobs and Quickley 3. Lexington, Ky. – May 13, 2016 – Eve Jobs and Quickley 3 had a strong debut Friday on day three of the Kentucky Spring Horse Show, besting a field of 31 in the Medium Amateur-Owner/Junior Jumpers in a time of 52.038 seconds. Dana Wille and Olympus were close behind Jobs with a second place finish in 52.104 seconds. From the start, Jobs made a plan that paid off in time saved. Quickley 3, an 11-year-old Westphalian gelding, is coming off of a successful winter season, having won the Medium Junior Jumper championships three times at the Winter Equestrian Festival (WEF). Jobs was full of praise for the Kentucky Spring Horse Show, with this being her first time competing at the show. Jobs plans to compete in the $25,000 Under 25 Grand Prix on Sunday and is enthusiastic about the opportunities that the division offers. Jobs also took her talents to the equitation ring Friday afternoon, placing third in the WIHS Equitation Hunter Phase. In the Low Amateur-Owner Jumpers, Madison Dehaven scored a meaningful win aboard Chanel, topping a field of 35 in a time of 33.611 seconds – a full second faster than Anna Dryden and Caprice 463 who took second place in 34.622 seconds. Careful planning in the course walk also paid off for Dehaven and Chanel. Similar to Jobs, Dehaven was enthusiastic about the environment at the Kentucky Spring Horse Show. Emma Kurtz dominated the Stonelea Ring on Friday at the Kentucky Spring Horse Show with back-to-back equitation wins in the WIHS Equitation Hunter Phase and the ASPCA Maclay on Clearway, owned by Dr. Betsee Parker. Kurtz and Clearway are coming off of a successful 2016 Winter Equestrian Festival (WEF) season, after claiming numerous top placings in the equitation ring, but Kurtz has not shown the 10-year-old Warmblood gelding since the circuit ended in April. Kurtz piloted Clearway, who previously had a famously decorated equitation career with Tori Colvin, past 24 horse and rider combinations in the WIHS Equitation Hunter Phase and 22 in the ASPCA Maclay to take the two blue ribbons. “It’s big shoes to fill for sure, but he’s an amazing horse and I love him,” said Kurtz. The pair impressed the judges in the ASPCA Maclay on Friday with a smooth and effortless round, navigating an in-and-out combination to a bending line as well as rollbacks and a brush fence. Out of the 22 original entries, 11 were called back to show on the flat. Kurtz’s equitation once again stood out as the judges challenged the riders to demonstrate a working canter, a half turn and reverse at the sitting trot, a lengthening of stride at the trot and a working walk. Finishing in second in the ASPCA Maclay behind Kurtz was Emma Wujek and Isle of Wight, owned by Castlewood Farm, Inc. of Wellington, Florida. Rounding out the top three was Lauren Brown and Cashmann, owned by Angela Brown. Sunday is “Derby Day” with the $15,000 USHJA International Hunter Derby and the $5,000 Hallway Feeds USHJA National Hunter Derby taking place. EQSportsNet will stream live webcasts of the $130,000 Hollow Creek Farm Grand Prix CSI3* on Saturday as well as the $130,000 Mary Rena Murphy Grand Prix CSI3* during the Kentucky Spring Classic on Saturday, May 21. EQSportsNet Full Access subscribers can also watch all rounds of the Kentucky Spring Horse Shows series on demand at www.eqsports.net. Lexington, Ky. – Another day of competition at the US Hunter Pony Championship presented by Sallee Horse Vans saw two more championship titles decided on Friday. Emma Kurtz and Truly Yours collected Medium Green Hunter Pony honors, while Augusta Iwasaki and Kingston were named the Large Green Hunter Pony Champions. Both championship divisions completed the Over Fences phase on Friday, earning the final 50% for their overall score, after receiving 25% from both the Model and Under Saddle phases on Thursday. Following the completion of the Green Pony divisions, Kingston was named Overall Green Hunter Pony Grand Champion, while Truly Yours was the Reserve Grand Champion. Kurtz (Hudson, Ohio) and Truly Yours, an eight-year-old Welsh Pony mare owned by Dr. Betsee Parker, were in third place heading into the final phase after earning 249.20 in the Model phase and 253.20 in the Under Saddle phase. A strong performance in the Over Fences phase gave the pair a score of 263.00 to finish the phase in first place and propelled them to the Medium Green Hunter Pony Champion title with an overall score of 1028.40. Augusta Iwasaki (Calabasas, Calif.) rode Small Suggestion to Reserve Champion honors with an overall score of 1046.80. She and the seven-year-old gelding of unknown breeding owned by Iwasaki and Elizabeth Reilly scored 247.27, 248.52, and 261.00 in the Model, Under Saddle, and Over Fences phases, respectively, to come in second in the championship division. The pair also added the Champion Owner/Rider title to their accolades. The third-place ribbon in the Medium Green Hunter Pony Championship went to Samantha Palermo (Merritt Island, Fla.) and Vienna. She and her own eight-year-Welsh Pony mare received 236.60 in the Model phase, 260.46 in the Under Saddle phase, and 258.50 in the Over Fences phase for a final total of 1014.06. The Best Turned Out Pony in the Medium Green section was Serafina’s Millenium, ridden by Hana Bieling. The Best Presented Model Pony was awarded to Two for the Bunny, ridden by Alexis Bauman. Iwasaki rode Ava Peck’s Kingston to top honors in the Large Green Hunter Pony Championship, finishing on a score of 992.77. She and the 12-year-old German Riding Pony gelding garnered scores of 251.65 in the Model phase and 261.67 in the Under Saddle phase on Thursday. The pair sealed the deal Friday evening by earning 266.74 in the Over Fences phase, winning the title by an impressive margin of over 34 points. 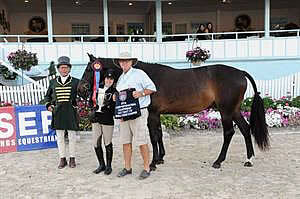 To top off their performance, Kingston was also named Overall Green Hunter Pony Grand Champion. Ellia Giuliani (Middleburg, Va.) and Brighton Decidedly received the Reserve Champion Large Green Hunter Pony title with a score of 1012.45. She and Kelly Tellier’s seven-year-old Welsh/Thoroughbred gelding had scores of 237.30, 250.03, and 262.56 in the Model, Under Saddle, and Over Fences phases, respectively. Emma Seving (Newtown Square, Pa.) and her own Captivating came in third in the Large Green Hunter Pony Championship with an overall score of 998.96. Seving and the seven-year-old Welsh Pony Cross gelding scored 248.70, 250.00, and 250.13 in the Model, Under Saddle, and Over Fences phases, respectively. The pair also claimed the Champion Owner/Rider title for the division. The Best Turned Out Pony in the Large Green section was O’Henry, ridden by Darian Topolski. The Best Presented Model Pony was awarded to Miss Penny Lane, ridden by Sydney Flashman. After two phases of competition, Vanessa Mazzoli and Find the Love have taken the lead in the Medium Regular Hunter Pony Championship. Mazzoli (Rockford, Mich.) and her own 11-year-old German Riding Pony gelding captured first place with a score of 257.88 in the Model phase and 254.91 in the Under Saddle Phase for a total of 512.79. Claire Campbell (Cochranville, Pa.) and Madeline Schaefer’s Leon, a nine-year-old Welsh Pony gelding, sit in second with a total of 505.91, while Devin Seek (Ocala, Fla.) and Heaven’s Sake, a 12-year-old Warmblood gelding owned by Bibby Hill, are in third with 505.67. The US Hunter Pony Championships presented by Sallee Horse Vans continue Saturday with ponies in the Medium Regular Hunter Pony Championship completing their Over Fences phase to determine who will receive the National title. The USEF Network presented by SmartPak will live stream competition from the Walnut and Alltech Arenas, courtesy of the USHJA Foundation. Tune in to the USEF Network for a complete schedule. Lexington, KY – August 7, 2015 – Entering the final phase of competition with two blue ribbons already under her belt, Augusta Iwasaki, aboard her trusty mount Kingston, had a target on her back as the one to beat in the Large Green Pony Hunters. Already a weekly champion in Thursday’s Small Regular Pony Hunter division, Iwasaki was hoping to add another 2015 U.S. Pony Finals win to her list of accolades. As the last to go, she and the chestnut Kingston were faced with the task of surpassing the 1,012.450 score set by competitor Ellia Giuliani and Brighton Decidedly, which the pair easily crushed with their cumulative score of 1,046.8 to sweep all three classes of the division and claim the lead spot in the victory gallop. Called “Prince” in the barn, Kingston will surely be treated as royalty tonight, as he not only carried Iwasaki to her second champion tricolor of the week, but also the title of Grand Green Champion. Their overall score was the highest of the 208 Green ponies in the hunt for the Small, Medium, and Large size-based divisions throughout the Finals. The 11-year-old rider from Calabasas, California, opted to ride Kingston, owned by Peck of Topanga, California, instead of one of her own family’s horses, which ultimately proved to be a smart move. The pair has been together since January. With one more pony still to ride this week, Iwasaki will try her hand at one more division, hoping to earn herself a third reason to celebrate in the Medium Regular Pony Hunters with Somekindawonderful. Giuliani and Brighton Decidedly, owned by Morgan Munz out of Califon, New Jersey, maintained their reserve spot in the Large Green Pony Hunters as the only other pair to break the 1,000 point mark. Rider-owner Emma Seving and Captivating captured the third position, followed by Christina Judy’s Recess from Chesterland, Ohio, ridden by Camryn Halley, in the fourth spot. Rounding out the top six were Top That, owned by Emily Elik-Burtard of Ixonia, Wisconsin, and ridden by Giavanna Rinaldi, and San Francisco-based Pretty Penny Farm’s Splendid, with Ava Leraris in the saddle. 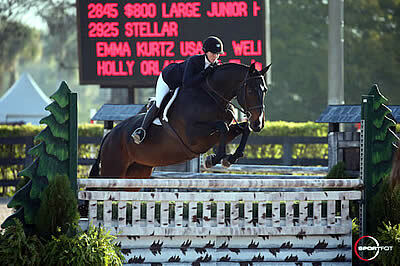 As the over fences portion of the Medium Green Hunter Pony division commenced, Emma Kurtz knew that she would have to navigate Truly Yours to a high-scoring ride to overcome her 21-point deficit behind Sophia Calamari and Unforgettable, the leaders after the model and hack portions of competition, and to jump from third position to the champion spot. Kurtz and Truly Yours ultimately did just that, impressing the judges to earning a 263-point score, the highest score of the over fences class, to secure the championship honors more than 10 points ahead of the next-closest finisher with 1,028.4 points. “It is always such an amazing opportunity to get to ride the ponies I do. It is just so much fun. 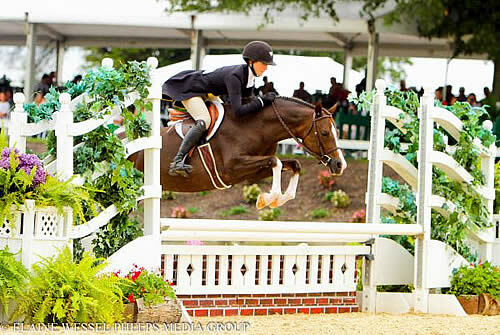 I love how family-friendly Pony Finals is – they make it really fun for everyone,” Kurtz commented. Dr. Betsee Parker, out of Middleburg, Virginia, owns Truly Yours and has owned many ponies and supported numerous riders throughout the past years, but was quick to note Kurtz’s special place in her heart. Kurtz’s win marks a new milestone for Parker: her eighth consecutive year winning a division championship, an accomplishment no other owner has achieved. Regarding her future, at least for the next few years, the 15-year-old plans to continue working with green ponies and horses, hopefully racking up more accomplishments in the process. “It is really fun to bring them along, see them excel and see them become the ponies they are today,” Kurtz said. Clinching the reserve position was Iwasaki aboard her family’s Small Suggestion. Third place went to Vienna, piloted and owned by Samantha Palermo out of Merritt Island, Florida, followed by Calamari and Unforgettable, owned by Forget Me Not Farm in Wellington, Florida, in fourth position. Olivia Ferro in the irons aboard Anderin’s Momento for Linda Evans of South Hadley, Massachusetts, and Taylor St. Jacques with the ride for Danielle Roskens of South Lyon, Michigan, on Motown Mini swept the last two top six spots. The Medium Pony Hunters kicked off their first day of competition Friday morning with over 150 ponies parading into the Walnut Ring for the model and under saddle classes. Vanessa Mazzoli of Rockford, Michigan, and her own Find the Love took the lead in the division with two top placings, concluding the opening day of competition with 512.79 points. She clinched the first place in the model, as well as the second place in the under saddle for a strong lead. Claire Campbell and Leon, owned by Madeline Schaefer of Westminster, Maryland, follow in the second place with 505.91 points, while Devin Seek and Heaven’s Sake, owned by Bibby Hill of Reddick, Florida, are only a hair shy with 505.67 points. Down the road in the Alltech Arena, 34 Pony Jumper riders took center stage, with nine teams facing off in the Pony Jumper Team Championship. Riding in championship format, competing over two rounds of courses, it was Zone 4 that came away with the 2015 Team Gold. Riders Charles Smith, Chloe Farmham, Hallie Rush and Anna Reisling left nothing to chance as they overtook the competition to end the two rounds of competition with only 20 faults to their team name. Zone 4 didn’t kick off the competition with a strong lead, earning a team total of 20 for the first round total, but they returned for round two with their eyes set firmly on the top finish. Charles Smith, 17, and Venice rode to a faultless second round score to set a trend for his fellow teammates. Chloe Farnham, 15, and Cookies & Cream duplicated his effort, while the youngest rider of the team, Hallie Rush, 12, rode to a four-fault score. It was 17-year-old Anna Reisling’s clear effort that confirmed their winning point total as she laid down the third clean round aboard Blue Me Away. As the second round came to a close, a hush fell over the Alltech Arena as it was announced that there would be a jump-off. Maxwell admitted that she had lost count of the points by that time, but when the announcer said that it was for the two 28-fault teams, the cheers erupted from the riders, trainers and parents as it dawned on them that Zone 4 won its third Team Gold in four years. “What a big opportunity this is, and having such an amazing team to go through this with, it has been such a wonderful time and experience,” Rush smiled as she held her trophy. 2015 marks Rush’s second time competing in the Pony Jumpers; however, the young talent is going into the Individual Championship on Saturday as the top ranked rider of the team, with only four faults. For teammate Farnham, the pony jumpers were a change of scenery from competing in the pony hunters at the USEF Pony Finals. After feeling the surge of adrenaline and the taste of victory, Farnham admitted that she is never looking back. With rescue pony Cookies & Cream, Farnham plans to compete in many more events in the future. The gold medal proved extra special for one rider on the team, 17-year-old Reisling. With her birthday approaching in November, her days as a junior are limited; however, it was on her bucket list to make it to the Pony Finals and compete for Zone 4 before aging out of the division. Blue just recovered from colic surgery after being found only a few months prior in a field with no pulse. Thanks to an insurance policy, he was rushed into emergency colic surgery where he pulled off a remarkable recovery. Although Zone 4 rode cloud nine after the announcement of their gold medal win, the silver medal was tied between Zone 2 and the combined Zone 9/10, both with 28 points. Zone 2 chose to send in Claire Jones and Proven Therapy, but four faults at the fifth obstacle would leave the door open. Stephanie Don and Joel followed consecutively, putting in their fourth clear ride of the competition, and earning Zone 9/10 the silver medal, while Zone 2 took the bronze. Don is currently tied with Elizabeth McDougald and Knock My Sox Off going into Saturday’s Individual Championship, each with zero faults. The 2015 USEF Pony Finals competition continues Saturday with the Medium Pony Hunter over fences classes beginning at 9 a.m. in the Walnut Ring at the Kentucky Horse Park. The Pony Jumpers will conclude Saturday evening in the Alltech Arena with the individual final round and the farewell class. To learn more about the USEF Pony Finals, please visit www.ponyfinals.org. For live results, please visit www.shownet.biz.